EL PASO, TX – ScottHulse shareholder R. Glenn Davis, an estate planning attorney in El Paso and Las Cruces, was a featured speaker at the 38th Annual Advanced Estate Planning & Probate Course, sponsored by the State Bar of Texas. The course was held in San Antonio, Texas June 10-12, 2014, and was attended by approximately 400 attorneys and other legal professionals. Mr. Davis spoke on the topic of “Administration of the Estate with Cross-Border Issues.” The course will be replayed by video in Dallas and Houston later this summer. Mr. Davis advises individuals, families and institutional clients in a variety of estate planning, wealth transfer, preservation and taxation matters. 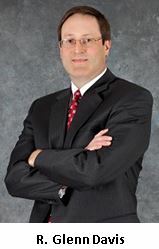 Mr. Davis is board certified in estate planning and probate law by the Texas Board of Legal Specialization.